For Pizza Hut, who has been offering online ordering nearly 20 years, the introduction of an Xbox 360 app seemed like a natural progression. In addition to ordering capabilities, the Pizza Hut app also offers the ability to share selected menu choices with facebook friends. Would be Pizza Hut buyers, take note: between now and May 6, your first purchase on the Pizza Hut app is 15% off. Is this the ultimate convenience? 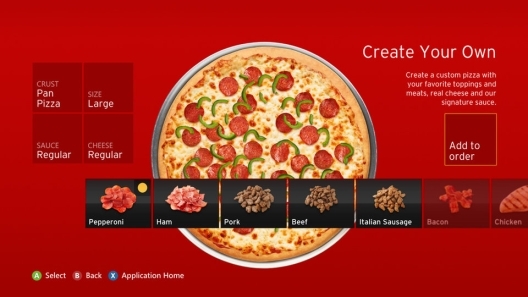 Do we, as individuals need a Pizza Hut app on our Xbox? Could this be the start of more "convenience" based apps? Sound off in the comment section below!